Sheila's Take | Is it truth, hypocrisy….or a little of both? This is a list (with IMDB links) to my top 10 favorite movies of 2017. It should be noted that I excluded all Marvel/DC Comics/Star Wars films from this list and there are no spoilers. 10) The Lego Batman Movie – I really enjoyed this movie. It is a must watch if you are a fan of the Batman franchise. 9) T2 Trainspotting – The first Trainspotting film was fantastic. The soundtrack is still one of my favorites. Im glad the cast was able to return for the follow up, but it can never capture the magic of the original. 8) Valerian – This one was visually stunning, but lacked talent for the two leads. Its a shame this movie didnt do better at the box office because I would have loved to have seen more from this series. 7) Mother! – I put this one on my list because it is so interesting how different everyones interpretation is, even on subsequent viewings. Im not a fan of Jennifer Lawrence, but she did an excellent job in this one. 6) I, Tonya – Who even knew this would be so entertaining? I was in my 20s when the Tonya Harding / Nancy Kerrigan incident occurred and I can remember the media frenzy. Margot Robbie did an excellent job portraying Tonya Harding. 5) Get Out – I did not expect a film like this to be written and directed by Jordan Peele. This is an incredible experience of a film. 4) Blade Runner 2049 – This was such an enjoyable sequel to the original. I keep describing films as visually stunning, but Ive never watched a movie and been so affected by the cinematography in the way this one did. 3) The Disaster Artist – I dont think you would like this if you havent experienced The Room. Tommy is such an interesting person and this movie was a joy in theaters. 2) Lady Bird – This movie should be something all mothers and daughters see together. Even tho I didnt see it until the last part of December, I almost picked it for my number 1 movie of the year. 1) Good Time – Easily my favorite movie of the year. This has to be one of the most original films Ive ever seen. This was an experience. I have not seen a number of films that from their descriptions, probably would have made this list. Those films are: Ingrid Goes West, Brigsby, 3 Billboards Outside Ebbing, Killing of a Sacred Deer. Do you agree with my list? Have you see these movies? What are your thoughts? I know…..I know….My blog has been silent over a year and I apologize. Anywhooo, I submitted my comments to the FDA today and since so many of you guys wanted to know what I said I figured Id put it here. My name is Sheila Faulstich and I smoked two packs of cigarettes for over 30 years. I no longer smoke thanks to electronic cigarettes. Since I began vaping a little over 500 days ago, I have also been able to reduce my nicotine level from 24 mg to 3 mg and even sometimes vape 0 mg.
As with others like me, FDA approved methods to quit smoking did not work for me for various reasons. My doctor attempted to help me quit smoking many times due to my health deteriorating. Some FDA approved methods were not compatable because of their side effects and I even attempted hypnosis. Even during my longest stretch without smoking, I still wanted to smoke and eventually went right back to smoking 2 packs a day. Right before I discovered electronic cigarettes, I was diagnosed with COPD and needed to use a rescue inhaler several times a day. I also suffered from a myriad of other health issues. Ever since I started using the electronic cigarette, I have not needed to use my rescue inhaler and my other health related issues and begun to improve. While we, the consumers, have no way of knowing the impact of the proposed FDA regulations, there is ‘talk’ in our community that only cig-a-likes would be available. This is a big problem for me. For one, these products are being manufactured by ‘big tobacco’. The same manufacturers who have poisoned me for 30 years. Its also worth noting that these cig-a-likes cannot be refilled with the nicotine level than I currently use, which is significantly lower than what is available with these products. I am fearful that if these regulations are put into place in the way they are perceived to be, that there will be an underground movement for these products. This increases the risk of the consumer since many of the vendors we work with now, may be put out of business due to the burden of the regulatory process. Many of us, the consumer, personally know our vendors. So many of the vendors we use are living the American Dream of owning a business for the first time in their lives, and employing people. In this economy, I dont think putting people back out of work is any answer. Many legislators, as well as what is contained in the proposed FDA regulations, are skirting around the issue of flavored e-juice. Quite honestly, I dont vape tobacco or menthol flavored e-juice. I personally do not like them. If I were to list all the flavors I vape, I would exceed the word limitations for commenting. Adults like flavors. Its just that simple. If you ban flavored e-juice, then where is the logic in allowing flavored alcohol or flavored nicotine gum, which is currently approved by the FDA. Should the proposed regulations go into effect as they are currently written, many would have no choice to go back to smoking. While I am not personally one of them, it is worth considering that many thousands of current non-smokers would be reduced to smoking after (in many cases) a substantial absence from cigarettes. Not all the proposed regulations are arguable though. I believe that most of us in the vaping community would gladly adhere to putting restrictions of these products out of the hands of minors. However, every vendor and electronic cigarette store Ive used, does not sell to minors already, so Im unsure of the necessity to over-regulate what is already being followed as an ‘industry standard’. In closing, I am perplexed as to why the FDA would need to step into this growing industry that has had no problems in the 5 years it has florished. As I stated in my last post, we are now electronic cigarette vaper-ers…. When I first began to vape, I thought I would not like flavored nicotine. I started vaping Tsumani brand tobacco at 24 mg. I should also add that it is 100% pg. This was extremely harsh on my throat. The first day on pure tobacco e-liquid was not pleasant. I got a harsh throat hit and coughed ALOT. I thought I made a huge mistake. After reading many forum posts, I thought we should give some flavors a try. My boyfriend wanted to try a blueberry flavor and our sales lady at Safe Smoke told that Pink Spot Vapors had pretty great juice. While Frank really liked this flavor straight, I still thought it was too harsh on my throat but decided to mix it with the tobacco juice…..I had a winner. Not only does it taste good, it makes the room smell fantastic. I did purchase the Safe Smoke brand coffee at 18 mg that I have vaped straight. This stuff tastes just like a cup of black coffee! I love to vape this after dinner. It doesnt produce too strong of a throat hit, but it does produce a good amount of vapor. I mentioned in my last post about Fuzion Vapor and the crankberry. I LOVE this juice. LOVE. Seriously. Its described as cranberry/rasberry flavored, but I think its more of a soft watermelon. Even at 24 mg of nicotine, its smooth and produces a ton of vapor. I also mixed this with my tobacco. This strengthened the throat hit and really enhanced the actual crankberry flavor. I also mixed this with Franks US Menthol 24 mg (just a few drops) and created a wonderful minty watermelon taste. We have been vaping these mixes for about two weeks. Last night we decided to purchase some additional Fuzion Vapor juices based on reviews I read online. Unfortunately taste testing at Safe Smoke is not doable using clearomizers, but one of the customers let us use his set up that uses similar cartridges as the testers. Whew! After tasting some of the flavors we settled on 2 additional flavors. One of the flavors I initially wanted to buy was not as good as I thought it would be (the banana one). Fuzion Vapor Ectoplasm – Oh my! This is like a citrus fruit lemonade. It has one taste on the inhale and another on the exhale and then the vapor smell….Its a good thing we cant drink this. It seemed a little thick in my clearomizer, and Ive let it steep a bit since last night and it seems it has gotten better consistency-wise. I cant tell a difference in taste yet. Some reviewers have said this is hard on equipment, so Im watching carefully. I might rinse the clearomizer out every couple refills though. I got this in 24 mg strength and there is no throat hit. The after taste is good but unless you are chain vaping, it can leave a little chemically taste. Im not sure if it needs to steep longer to get rid of that tho. Fuzion Vapor Starscream – Words just cant even describe how good this juice is. Ive read other reviewers saying this is like a Cherry Starburst candy, but its so much better than that. I steeped it last night and most of today and it has gotten so much better. I admit I mixed some tobacco (just a few drops tho) and it has enhanced it greatly. The vapor smells so good. The after taste is like youve actually ate a fruity candy. Nothing chemical. I got this in 24 mg also, but I think when I get it again, I work down to the 18 mg because I like to vape it too much! Both Frank and I wanted to try a stronger watermelon. We decided on Pink Spot juicy watermelon at 24 mg. Both of us chain vaped this on the way home from the store. It tastes fabulous and the smell is too good. It left a great taste in our mouths. I did end up mixing mine with the Fuzion Vapor Starscream and Jeez. Wow. It was like vaping cotton candy. I almost could not stop vaping this last night! I definitely LOVE the new juices we have. Earlier today I had been out of the room we had vaped in, and when I walked back in, it smelled SOO good. I can only imagine how good the vehicles will smell! Changing over from cigarettes to these electronic cigarettes has definitely been a great thing. Im a vaper, Hes a vaper, Wouldnt you like to be a vaper too? So he took me up to a place in the local mall called Safe Smoke (Westminster MD). The sales lady asked me how much I smoked and let me try a few different ‘strengths’ of tobacco. After choking myself, we settled on 24 mg e-liquid. I mention choking myself because you cant inhale these things the same way you smoke a regular cigarette. I was using one of the batteries from Franks kit, so I wouldnt have to plunk down $75 for my own kit, not knowing if I would care for this electronic variety. But after two weeks, I HAD to get my own. Its been almost a month now since Ive went the exclusively electronic route and we have done a little experimenting…..
We are using the ego-t battery with vision clearomizers. Frank has a green battery and a black battery, while I have a brown battery and a white battery. We both have four vision clearomizers. 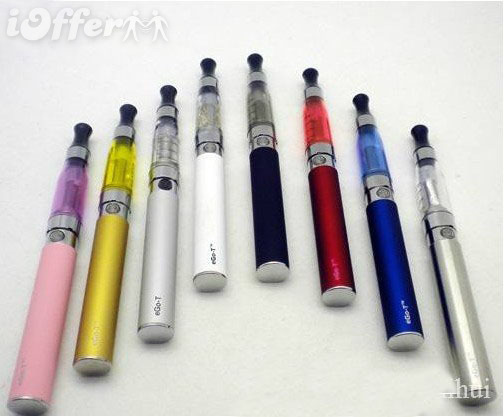 (They come in different colors and several different sizes fit on the ego-t battery) We both like variations in flavors so four clearomizers work for us. Clearomizers also seem easier to work with when filling and refilling. They are also pretty simple to clean (we sort of messed up cleaning one, so despite what you see online, do not remove the wick when cleaning). The best part about ‘vaping’ is the flavors!!!! No matter if you smoked menthol OR regular tobacco, you will not have the same taste with an electronic cigarette. Thats probably a good thing. We found some really great flavors. They taste great on the inhale and exhale and produce great vapor. Frank really likes the Pink Spot Blue on the Berry. Its a fabulous blueberry and the vapor smells fantastic! It produces an excellent throat hit. Im privvy to the Fuzion Vapors Crankberry. Its a rasberry/cranberry mix. Its very smooth, but it doesnt produce a great throat hit, but the flavor way outweighs that. (Buy Crankberry here) Ive heard that the guy who makes these e-liquids was a chef, so most of his flavors have great reviews. Both of us mix these flavors with our tobacco. I like a few different variations. The sales person at Safe Smoke turned us onto mixing our e-liquid. But I have to say….the best part about vaping is there is no cigarette smell! Depending on what is in your clearomizer, you can have a fruity smell or no smell at all. You and your home will no longer reek of cigarette. Your breath will not smell like you ate an ashtray. AND, you will be able to actually taste your food! And, there are several forums online where to get e-liquid reviews, support if you want to wean to ZERO nicotine, and also some pretty neat do-it-yourself mods. I have to say, my biggest issue with smoking was the hand to mouth action, so I carry my ego-t EVERYWHERE! Frank has the nicotine to overcome. Both are big obstacles when quitting this habit. But electronic cigarettes do fulfill both of these issues and so far, so good. We havent smoked a regular cigarette in over a month!